Mark your calendars now for the next Tour. Your senses will be delighted by creative quilts on display in distinctive gardens! What a stellar combination: Spectacular landscaped gardens adorned with traditional and contemporary art quilts! This event is a MUST SEE for those who love gardening (the #1 national hobby) and/or quilting (the oldest national craft.) 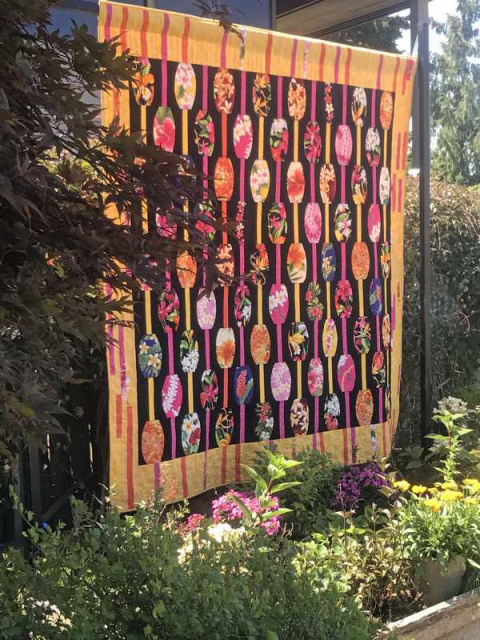 This Tour, a showcase for Mukilteo (rated in the top 10 of "Most Livable Cities"), is co-sponsored by Mukilteo Lighthouse Quilters and the Mukilteo Way Garden Club. 2019 Poster features: Hawaiian Abacus by Wendy Stafford, 2017 photo by M Ledbetter in the Newsome Garden. See the slide show from last year and the prior shows on our slide show tab! Thanks to the City of Mukilteo for their support of this event through partial funding from Lodging and Community Support Grants.